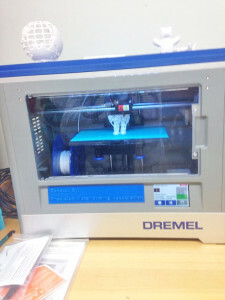 3D Printer that was loaned to CTA. The CTA high school physics class was loaned a 3D printer from Rick Mushing, a consultant from Kent ISD, who did a STEM presentation on future revolutionary technologies. These technologies included 3D Printing, Autonomous Vehicles and Artificial Intelligence. The high school physics class was tasked with creating a unique electronic device utilizing a 3D printer. Two projects that resulted from the assignment were a 3D printed car to go up a ramp in a unique way; another group programmed a race car game at a KCTC class, creating an interface with it using the Makey Makey software and 3D printed a steering wheel for the game. The Digital Media: Stop Motion class had the opportunity to use the printer to create props for an animation project and the sixth grade students got to learn 3D design on TinkerCad in their science class. The 3D projects also cover Next Generation Science Standards, which were adopted by the Michigan Department of Education in November 2015 and is a multi-state effort to create new education standards that are rich in content and practice, arranged in a coherent manner across disciplines and grades to provide all students an internationally benchmarked science education. Occasionally, adverse weather conditions or other emergency situations may make it necessary to cancel school, delay the start of school, cancel evening activities or run buses on main/paved roads only. When these situations occur, notice will be communicated to WOOD TV 8, WXMI Fox 17, and WZZM TV 13 through the Grand Rapids Area Information Line (GRAIL) to all subscribing area media. In the event of a 2-hour delay, students will be picked up by the bus approximately 2 hours later than their routine pick-up time. Morning Early Childhood Special Education (ECSE) and morning preschool classes will be cancelled. Campus Kids will be open on days that school is closed and / or delayed unless otherwise noted in school closing announcements. Buses will not transport students to Kent Career and Technical Center for 1st session when a school delay or cancellation is issued. Students will be given a weather-related absence at KCTC when we are officially not transporting them. Students who choose to drive personal vehicles to KCTC on school delays or cancellations assume responsibility for their decision. When school evening activities are cancelled, this cancellation also includes all clubs, organizations and extra-curricular events held on campus and scheduled for that evening. For more information, please visit www.csredhawks.org/Parents/Emergency-Notification/index.html or call 616-696-1204.